If you want to help the environment, you are better off buying an electric car than putting solar panels on your house says a report by Wellington-based Concept Consulting. 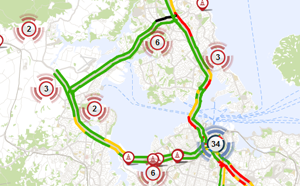 Who in New Zealand has the worst traffic congestion? Drivers on New Zealand's big city motorway networks struggle to hit 20kmh on an average commute. And it's not all just Auckland - Porirua commuters in Wellington rank third in the frustration stakes, with an hour-long ride on a typical morning. In contrast, Christchurch commuters zoom along at well, a still-leisurely, 34kmh. New Zealand needs to crack down on those using international licences in the country, because a third or more of them have never sat a test, a road safety campaigner says. Fifteen to 24-year-olds represent 15 per cent of the population yet accounted for 24 per cent of the 321 road fatalities last year. Although the road toll in this demographic has dropped 52 per cent over the past 10 years there is still work to be done, according to Road Safety Education programme manager Simone Randle. West Auckland high schools and the team from Road Safety Education are tackling the issue head on. "Computers that control cars of the future can be considered drivers just like humans, the US federal government's highway safety agency has found. Tourists too scared to take to the wheel, or simply wanting a more relaxing holiday, are paying to be chauffeur-driven around the country. The AA's driver training tool for tourists is proving to be a hit with travellers it is too early to say whether it is reducing the number of crashes, the organisation says. The mystery of a seemingly abandoned car on the North Shore continues. The car, which was parked on Peach Rd in Glenfield on Auckland's North Shore for two months, has mysteriously moved to another location just 500 metres away. Volkswagen AG in Germany has confirmed the total number of New Zealand diesel vehicles affected by the emissions software issue to date is 5,548. A police officer made a traffic stop but wrote no ticket. There was no one actually driving the car - it was a Google self-driving car being tested on local roads in California.